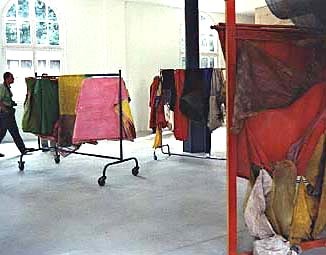 In November 1964, Oiticica wrote: »The discovery of that which I call 'parangolé' (slang for a situation of sudden confusion or excitement among people), marks a decisive point and defines a specific position in the theoretical development of my entire experience with the question of three-dimensional color construction. This especially relates to a new definition of what »the object« or better, »the artwork«, is seen as. One could see the phenomenon of 'parangolé' as an art-form related to Body Art, Happening, or Performance. 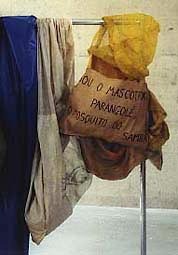 One of the most well-known examples were the 'parangolé'-capes, worn by friends of the artist. A wide variety of other objects - such as banners and tents - add to the 'parangolé' experience as a whole. Central to the 'parangolé' are interaction, movement, and altering of peoples´ sense of reality.